I was able to meet a lot of people during last week’s 24 hour photowalk. This old fella’ was easily one of my favorites. 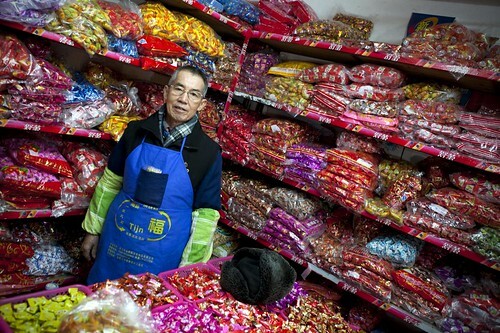 Mr. Wang owns a candy shop in the mall off Fie ‘e Lu. He was understandably in good spirits when we met. New Year’s Day and Valentine’s Day both fell on the 14th this year and he was breaking sales records. He couldn’t understand why I, or anyone else for that matter, would be even remotely interested in him. His employees egged him on and he quickly warmed up to the idea of talking to me. So much so I didn’t really find out very much about Mr. Wang. He was too busy peppering us with questions about me. He told me he loves America, asked why I didn’t have blue eyes, wanted to know why I was in China, if I was rich and why I was so fat. As an aside, none of those question are really considered rude here. He was shocked when I told him I lived less than a mile from his store. It wasn’t easy getting a clear shot, his mouth rarely stopped moving! 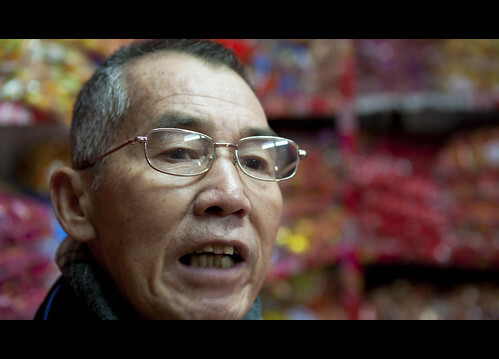 I did learn Wang’s a retired factory worker and he’s owned this shop for the 12 years since leaving the factory. As is typical, there was no rhyme nor reason as to what the old man stocked in his shop. In addition to the candy, he sold liquor and a huge selection of wine. I wondered aloud what flavor of rock candy goes well with a Cabernet. After getting the translation, without missing a beat Wang suggested the grape candy. I couldn’t tell for sure, but he may have been serious. The temperature was around 40F, not so good for most reds I’m thinking. In a few months many of these same bottles will be exposed to temps in the 90’s. 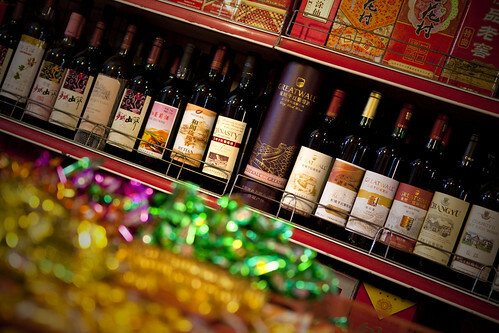 Yeah, it’s tough to get a decent bottle of wine in Liuzhou. Lao Wang wouldn’t let us leave without giving us 2 huge bags of candy. With an old soul and a sweet spirit about him, he’s one of those guys you meet you just know he’s “good people”. I’m sure I’ll visit again. 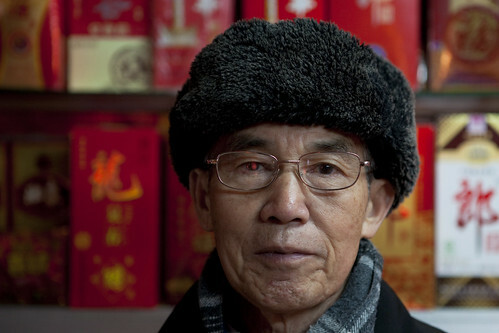 China Digital Times is featuring a slideshow of my Spring Festival photographs today. Kinda’ cool. Check it out here if you like. I’m still working on the website and blog re-design. When we launch the new sites, I’ll be giving away some limited edition, signed and numbered prints as well as a copy of my latest book, “Saving Face – A Portrait Collection”. More details coming as we get closer. Thanks for making your way here… until next time… Peace! ~ by Expatriate Games on February 23, 2010.
lol at the questions! I once had a chinese security guard ask my german friend (in chinese) why is she (referring to me) YELLOW? lol he’s serious. The GFW doesn’t usually let you get to wordpress and certainly the CDT link won’t work, you have to use your VPN or proxy. Sometimes the wall is down for a while, like the last day or so I could get onto the blog without the proxy, but it is blocked again now. Great photos Michael. These guys sound like quite the characters. Another one that made me smile. Sounds like Wang is quite the character. Had to go see that last pic in large, the colors are overwhelming. Besides the fact that it is all candy, those pinks are a little girls dream come true. Is that a red-eye Michael? I enjoy these casual profile interviews that you do. It’s heartwarming and has that “This American Life” feel to it. I loved listening to those stories on NPR on Sat/Sun mornings. Just as much as I enjoy your stories and photographs. No not a red-eye, I didn’t have a flash with me. It’s a reflection off his glasses that was in the perfect spot. I could have taken it out but decided against it. I remember “This American Life” too. If this evokes that memory then I’m very happy. Loved that most recent feature on your blog… that guy was quite the pack rat! I’m so happy you did a profile feature on the Candy Man (one of my faves). He sounds exactly like I imagined him to be and his questions were so honest and wonderful. The fact that he was so chatty just went hand-in-hand with all that sugary deliciousness.